My affection for muffins is no secret. 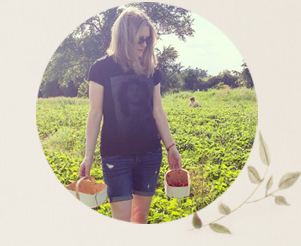 I may have mentioned my love for these portable, healthy snacks about two dozen times on this blog. It's funny because I don't really eat bread often. It doesn't excite me much so I see it as a waste of calories. Muffins, on the other hand, are a bread-type product I can get behind! Especially when they are homemade, wholesome and full of fruity goodness, like these vegan Peach Walnut Muffins. 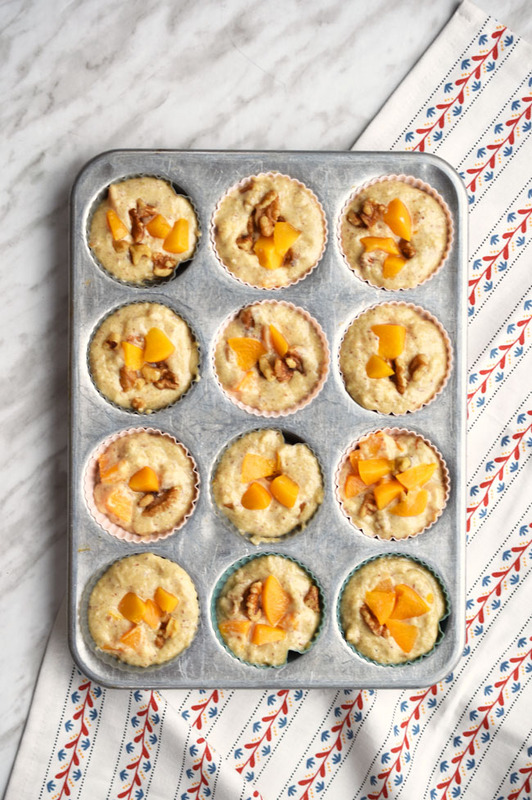 These muffins would make a lovely Christmas morning breakfast addition. Munch on them while the kiddies open their gifts. They will also transition well into the New Year, when you're feeling all that post-holiday guilt and looking for healthier snacks. 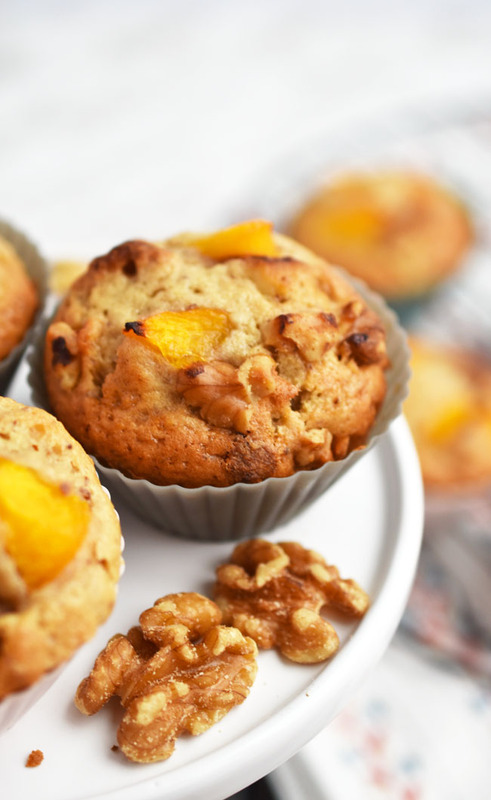 These Peach Walnut Muffins take advantage of the convenience and affordability of canned California cling peaches. The majority of canned peaches available in Canada are California cling peaches. They are grown on family farms, and, according to a study by the Linus Pauling Institute at Oregon State University, they are higher in antioxidants and Vitamin A and are nearly four times higher in Vitamin C and 10 times higher in folate than fresh peaches. I like to line a muffin tray with silicone or paper muffin liners for convenience. Then I use an ice cream scoop to fill each muffin cup with batter, right to the top. I dice a full cup of sliced canned peaches for the fruity interior of the muffins. 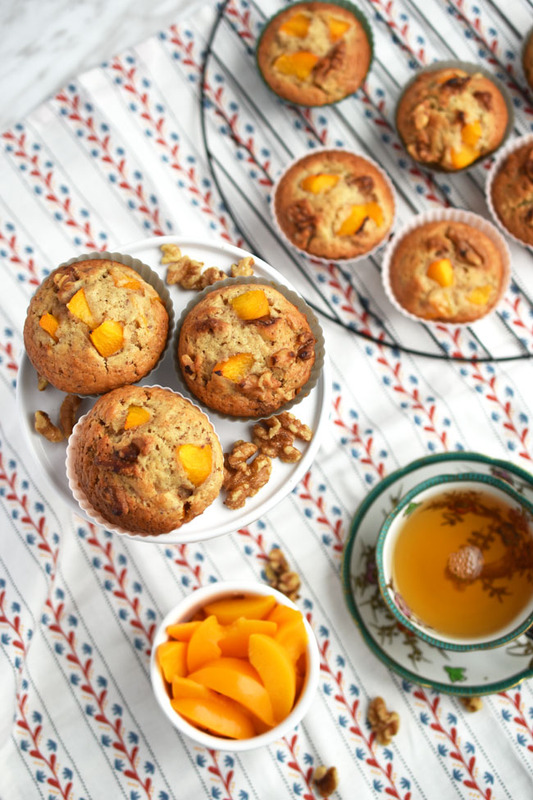 The canned peaches retain their shape very well during the baking process, so I put some of the diced peaches on top of each muffin (along with walnut pieces) to make the muffins look pretty. 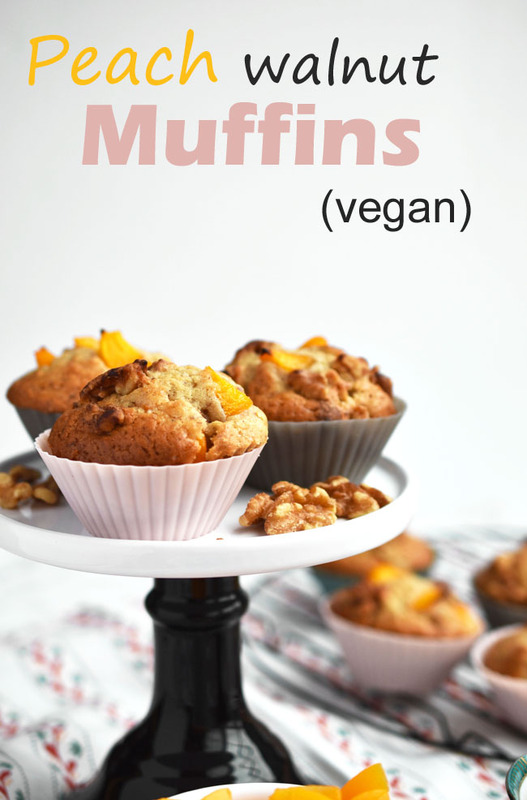 These muffins are indeed vegan, but don't let that intimidate you if you're new to vegan baking. 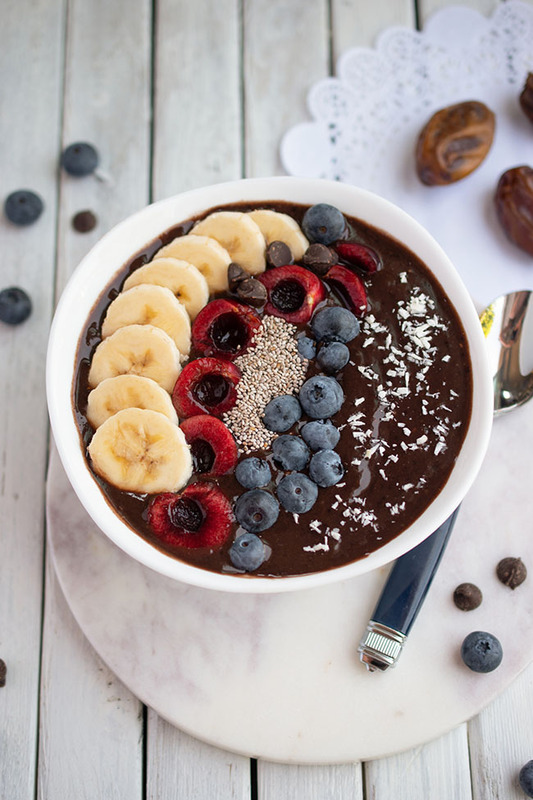 The recipe doesn't call for any unusual ingredients or trendy superfoods. Just simple ingredients like light spelt flour, organic sugar, flax, applesauce and non-dairy milk (use whichever one you like best). I'm sure you could use all-purpose flour as well. I just prefer light spelt flour because I find it gives baked goods a nice lightness. I have called for grapeseed oil, but I often use light olive oil for baking as well. The crispy baked walnuts on top of the muffins make for a pleasant crunch too. 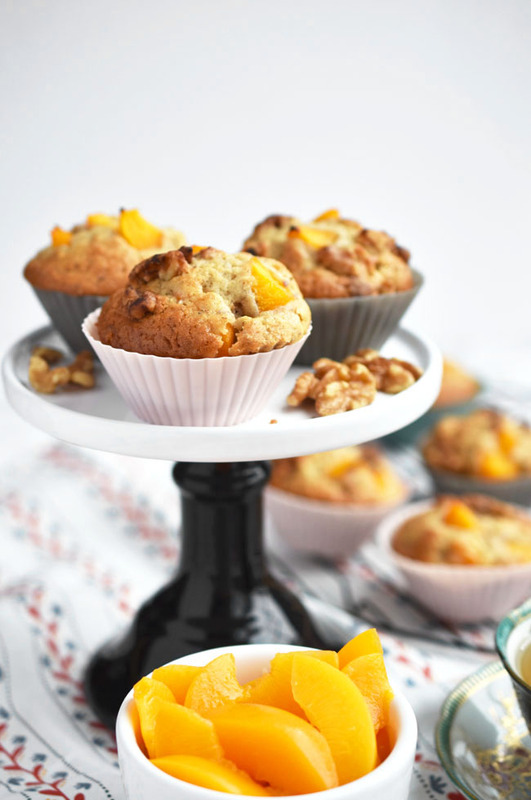 These Peach Walnut Muffins are super simple to make. It's a handy recipe to whip together if you have last-minute guests coming. Your probably have the ingredients in your fridge and pantry already. 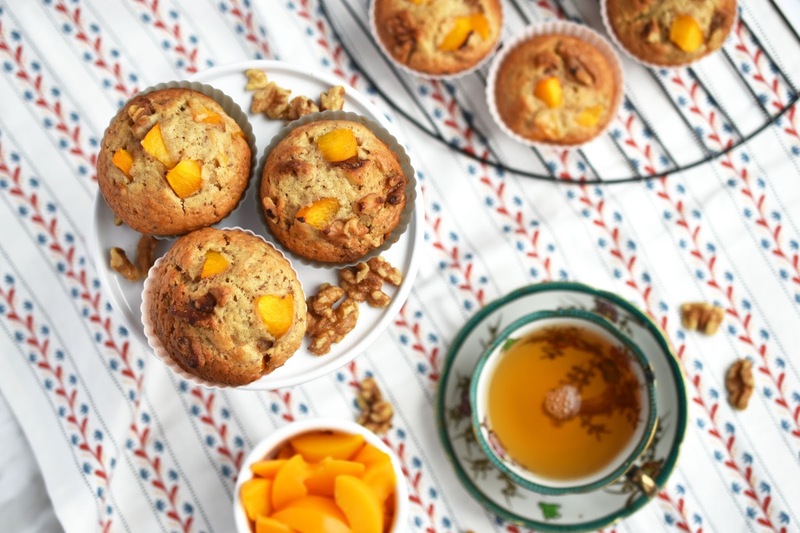 Overall, these vegan Peach Walnut Muffins are tender, delicious and sweet - a great accompaniment to a cup of tea or coffee. What about you? Are you a muffin enthusiast like me? Will you give this recipe a try? Line a muffin tray with 12 paper or silicone cups. In a large bowl, mix together flour, sugar, baking powder and salt. Add flax "egg," applesauce, milk, oil and vanilla. Stir together. Gently fold in peaches and walnuts. Bake for 25 to 30 minutes, until a knife inserted in the center comes out free of batter. Cool and enjoy! these look absolutely delectable !! These would be the perfect addition to any brunch menu!! I love this recipe and my son being Vegan will as well. These look so good! I can't wait till peaches are in season! We've been struggling with school-day breakfast ideas, and these would be perfect with a glass of soy milk! 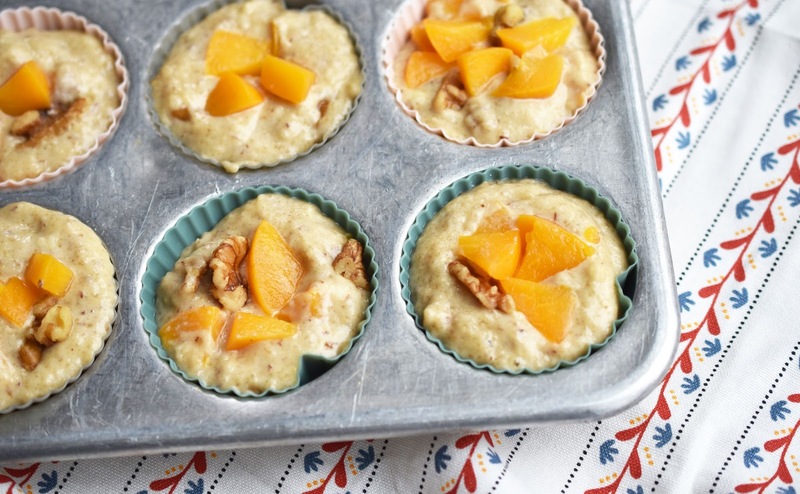 I've never tried peaches in muffins - great idea! Thanks. Oh these sound yummy, thanks for the recipe.